(Nanowerk News) Nearly 900 extrasolar planets have been confirmed to date, but now for the first time astronomers think they are seeing compelling evidence for a planet under construction in an unlikely place, at a great distance from its diminutive red dwarf star. 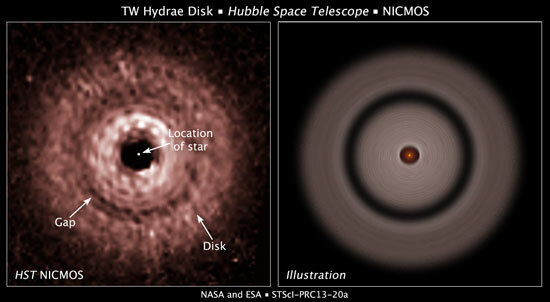 This graphic shows a gap in a protoplanetary disk of dust and gas whirling around the nearby red dwarf star TW Hydrae. The gap's presence is best explained as due to the effects of a growing, unseen planet that is gravitationally sweeping up material and carving out a lane in the disk, like a snow plow. In the NASA Hubble Space Telescope image at left, a gap can be seen about 7.5 billion miles away from the star in the center of the disk. If the putative planet orbited in our solar system, it would be roughly twice Pluto's distance from our Sun. The image was taken in near-infrared light by the Near Infrared Camera and Multi-Object Spectrometer (NICMOS). Astronomers used a masking device on NICMOS to block out the star's bright light so that the disk's structure could be seen. The Hubble observations reveal that the gap, which is 1.9 billion miles wide, is not completely cleared out. The graphic at right shows the gap relative to the star. TW Hydrae resides 176 light-years away in the constellation Hydra (the Sea Serpent). The Hubble observations were taken on June 17, 2005.